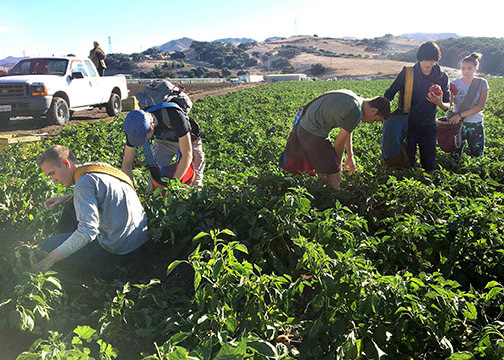 SAN LUIS OBISPO — A group of 18 Cal Poly Honors Program students and a faculty member helped harvest more than 1,000 pounds of bell peppers during a recent gleaning project at Talley Farms in Arroyo Grande. 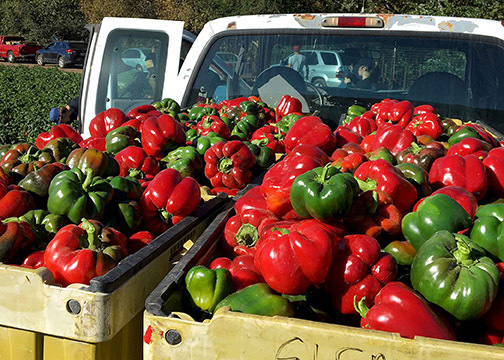 GleanSLO, a program of the Food Bank Coalition of San Luis Obispo County that brings together volunteers to salvage produce that would otherwise go to waste, received the fall bounty. The Oct. 21 event was part of GleanSLO’s third annual Glean805, a four-day effort to provide fresh, local produce for hungry families in the county, while drawing awareness to greater gleaning efforts in the Tri-County region, said Roxanne Sanders, the San Luis Obispo-based organization’s project manager. Cal Poly founded its University Honors Program in 1999. Today, nearly 450 students are enrolled with a program goal to increase it to a steady-state enrollment of about 500 students. The program provides an academically enriched learning experience for Cal Poly’s most outstanding and highly motivated students. It brings together students, faculty and friends of the university to seek challenges, participate in experiential and interdisciplinary learning, grow as individuals and expand the boundaries of their academic potential.